Like in so many professions, it is the mark of an excellent guide to work him or herself out of a job. There is little that pleases me more than to have students and clients go out on their own and apply skills acquired with me to their "unsupervised" mountain endeavors. To that end, in addition to providing at least some degree of education on every single guided outing I lead, I have a few projects that further formalize the mentorship. Yours truly, showing the ropes. Wind River Range. Hans Egger photo. First, and the most relevant to the most people, I am available for 'pro bono', long-term, objective-specific mentorship and preparatory programming. I am pretty excited about this program. I've done it "informally" for years, but finally have the efficiency and effectiveness to offer it up to the general public. Basically, if you have any sort of goal in the mountains, on skis or climbing, I am happy to coach you through the steps required to attain that goal. We will discuss, primarily or exclusively via email, things like attaining required technical skills, improving and gauging physical fitness, efficient logistical planning, and designing a regimented progression of experience and judgement. Simply email me a brief "application", noting your objective, your approximate timeline, and your relevant experience. Since I am just starting this out, I don't know exactly what my capacity will be. It will depend some on what sort of applications come in. Basically, I will deny no applications. Realize that I too have my strengths and weaknesses. On skis, my background is in human-powered, high-and-wild ski mountaineering in North America. I have skied all over the continent, concentrating on long-distance, high-energy touring on all sorts of terrain. Multi-day traverses in the Sierra, Teton peaks, and obscure Alaska ski touring are examples of where I have the deepest resume. My climbing specialty is in classic alpine terrain. Ice, rock, snow, glaciers, all at moderate to high altitudes in the wilderness is my forte. I do quite a bit of multi-pitch rock climbing in places like Yosemite and Red Rock, but that isn't where I excel. Backcountry rock in the Lower 48, and technical mid-altitude peaks in more distant latitudes are right in my wheelhouse. Cruise around the rest of my site here to see if my style and background suits yours. There are absolutely no strings attached to the mentorship described here. However, note that I highly value supervised training and experience with certified guides. As a certified guide I am sure to have suggestions as to how you may employ my services. I can also direct everyone to alternatives, in other regions or with other budgetary restrictions. You want to climb Charlotte Dome in the Sierra. Or the Diamond on Longs Peak in Colorado. Or the California 14ers. Or University Peak in the Wrangells. Or the Grand Traverse in the Tetons. Or you want to do some ski mountaineering in Valdez, a hut trip in the Selkirks, or some sick steep line outside of Silverton. You have no experience and want a complete introductory road map, or you are on the verge of taking the next incremental step in the mountains and want a little oversight for that. Whatever your pleasure, you let me know what you want to do, how long you think it will, or want it to, take for you to prepare, and give me a rough idea of your current experience. We'll go back and forth, designing together a training and preparatory plan. I'll have very few "answers" for you, but I will get you asking the right questions. Which sort of new technical skills might you need? Are you fit enough? How much time can you dedicate to training and preparation? I'm not going to hold your hand, but I will prompt you through the process. I have a solid understanding of what various mountain endeavors require, and how people of all levels can get themselves there. A little more in depth "example" here, in case it's all still too vague. You wish to ski all three of the Tetons (Grand, South, and Middle) in Wyoming over the next three years. You grew up skiing, raced a little in high school, and took your level 1 avalanche course last season. You have good touring ski gear, and have skinned about 10 days total, mainly on forested, roadside terrain with slightly more experienced friends. You used to ride bikes a lot, but job and family have conspired against maintaining the physical fitness you would like. Live in any one of the major western cities, work in a field that allows slight flexibility in scheduling, with a little advance notice. Money is tight, but you value good equipment and solid instruction. Improve your diet. Usually the best first move is to cut out sugar and/or alcohol. Spend five hours a week in dedicated training. Two hours a week in supervised weight training, and two 1.5 hour sessions of low-intensity cardio. 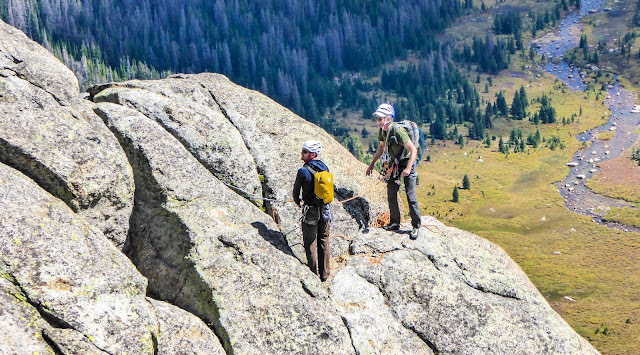 Do what it takes to plan one full day, every two weeks, in the mountains. 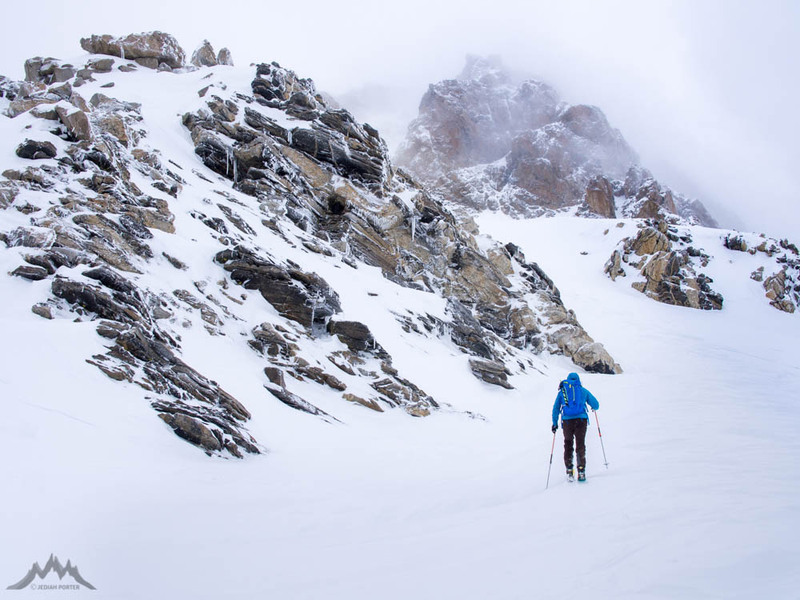 6-8 hours of ski touring or mild mountaineering/hard hiking (season dependent). Some of the best learning we'll do together is in debriefing these real-time missions after the fact. What's your partner situation? Will you be tackling these peaks with a specific person? Where's that person at in their own skills and preparation? Or would you like to do the peaks guided? I'd set up a partnership progression too. Perhaps you have no one to do it with. There are ways to find people for that. Take a level 1 avalanche refresher, for instance. Go to a climbing festival or backcountry ski equipment demo day. If guided, begin correspondence with a certified guide for that endeavor. I can check my schedule, or make a referral. Set aside a week-long vacation in late March in the Tetons. With your partner. And your family. Be ready to give the South Teton a try, if conditions allow. The other sorts of mentorship I do are more targeted and specialized. I have begun working with a small group of aspiring guides to increase their professionalism in the field. The certification process in the US now requires formalized mentorship, and I am honored to take on a handful of guides working their way through the rigorous training and certification process. Finally, I instruct and mentor "on the clock" in a variety of capacities. I care a great deal about avalanche courses, basic rock instruction, and everything in between. I can and do arrange all sorts of formal training courses in a broad spectrum of mountain skills. I make sure to get to at least one climbing or skiing festival each year to teach clinics. Lastly, every trip I do can be conducted with some amount of participatory leadership. Whether it is as simple as sharing the pre-trip route selection process, or as advanced as following a climbing or skiing partnership to "audit" their skills and judgement in real time, every outing is an opportunity to further ones skills. Virtually everywhere I operate we can arrange for guests to lead almost every component of the experience, with my supervision and feedback.